Combining workplace training with classroom-based learning reduces skills mismatch by providing students with practical skills and experiences. One way to produce skilled workers is by training them in the workplace where they get practical knowledge and skills. Vocational training programs will be more effective if work-based learning and structured off-the-job learning in a classroom setting are combined. Across the globe, countries have prioritized work-based learning programs as a way to train their workers. It is one of the 2020 priorities of 27 European Union Member States, the five EU Candidate Countries and the three European Economic Area countries. Morocco, Kazakhstan, Switzerland, and Turkey are also implementing work-based learning schemes for students. Work-based learning refers to all forms of learning, both initial and continuous, that take place in a real-world environment. It provides individuals with the skills they need to successfully find and keep jobs, and to advance their career. It is particularly successful when it is well integrated into the education and training system and combines elements of learning in the workplace with classroom-based learning. All work-based learning setups share two features: a direct relationship between employer and learner, and an element of on-the-job learning. In Austria, Denmark, Germany, and the United Kingdom, work-based learning often comprises a formal apprenticeship contract that offers young people a program of structured learning on-the-job, coupled with structured off-the-job learning in a technical and vocational education and training (TVET) institution. Apprenticeship programs are backed by the government, employers, and apprentices themselves. In developing countries, only a very small percentage of young people benefit from this type of work-based learning. The vast majority learn informally on the job from their employer in an unstructured way, with learning often interspersed with unskilled, menial tasks. These ”informal apprentices“ usually lack the benefit of certification and recognition, which works against the student. Work-based learning is not merely an opportunity to experience the workplace and gain some familiarity with it. Rather it is the main mode of learning for the student who has a contract, written or oral, with an employer as opposed to being enrolled full time with a training provider. Work-based learning can provide a strong learning environment and ensure that there is demand for the acquired skills in the labor market. Employers benefit by using it as a recruitment tool and as a means to benefit from the productive output of learners. The country benefits from an increase in skilled labor without heavy government investment, as the cost is usually shared between learners and employers. Learners benefit not just from industry-relevant training but also from improved job prospects, social inclusion, and a smoother transition from school to stable employment, which otherwise can be as long as 5 years. Although it can be a valuable teaching tool, not all workplace training is useful to learners. It needs to strike a balance between equipping learners for the immediate job market and providing them with a rounded educational experience and longer-term job mobility. 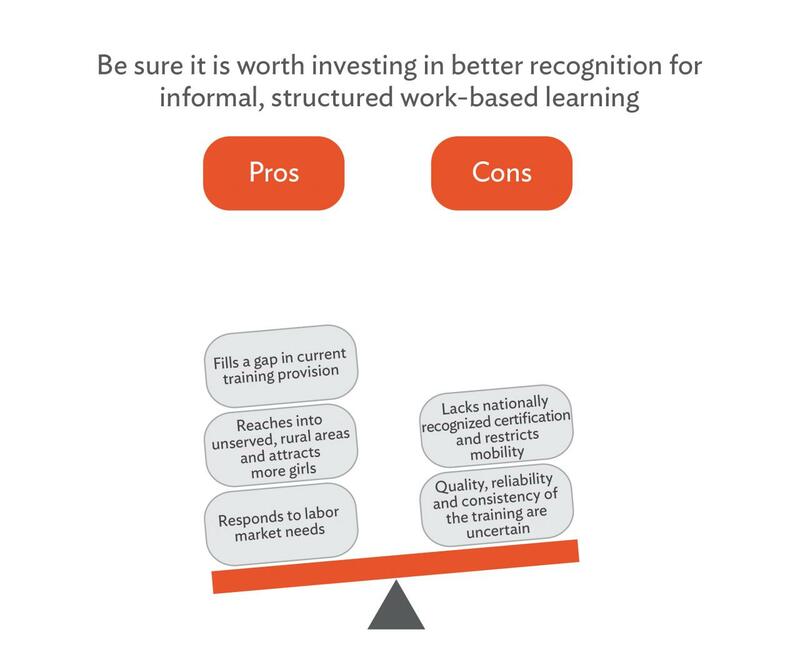 The challenge facing governments across Asia is how to improve work-based learning at every level, and how to adopt some of the characteristics of structured programs to enhance informal training. This is particularly urgent as work-based learning is prevalent in countries with large informal sectors, like in much of Asia. Initiatives to improve learning while working will have more impact if these extend beyond the relatively small formal sector and reach out to micro-, small, and medium-sized enterprises, which dominate the region’s informal sector. What Are the Three Models of Work-based Learning? This type of training is highly regulated. In general, a legal framework restricts the autonomy of employers and defines the content and length of the training program. The trainings usually focus on medium-sized and large workplaces, with other stakeholders providing off-the-job training assessment and certification services. Government funding may be available to offset the costs to the employer. The training program complies with national standards and includes both core and technical skills. Graduates receive national, sector-recognized qualifications, which make them highly mobile within the labor market. This type of work-based learning is excellent, but it is rarely practiced in Asia. Both public and private employers in India are legally obliged to engage apprentices and pay them a stipend, the cost of which is shared by the government. Apprentices follow an educational program as well as on-the-job training, and are tested at the end of their program, which lead to a formal qualification. The system is based on the principles of learning-by-earning and learning-by-doing. In the People’s Republic of China, the Shanghai Construction Group runs its own upper secondary school and college, with majority of students from poor backgrounds. The curriculum includes core general subjects as well as construction engineering, computer-aided design, and mechanics. On their third year, students do practical work in the company, rotating through several departments and receiving a stipend. The company recruits about 750 of the graduates each year, with the remainder finding jobs in other companies. In Thailand, the German-Thai Dual Excellence Education project was set up to introduce dual- system engineering apprenticeships to companies. The project is backed by the German-Thai Chamber of Commerce and GIZ. In Viet Nam, German company Bosch introduced dual system apprenticeships for the workers in its plant in the Dong Nai province. Of the total cohort in 2017, 23% are female. In Lao People’s Democratic Republic, Australian miner MMG runs a 5-year apprenticeship program for local community members at its Sepon mine, certificated by the Royal Melbourne Institute of Technology. Sri Lanka’s Civil Aviation Training Centre supplements its training programs with supervised on-the-job training at local operational facilities. Australia has supplemented the number of apprenticeships offered by employers by introducing a scheme in which group training organizations employ apprentices and place them with host employers. This approach can be particularly useful in rural areas with few employers or in situations where employers are unsure of hiring apprentices for themselves. The Kumul Petroleum Academy in Papua New Guinea was set up due to the lack of skilled nationals to fill technical and operational jobs in the energy and engineering sectors and the subsequent over-reliance on foreign workers. Graduates will be internationally certificated and accredited. The academy, jointly owned by the national oil and gas company and the South Pacific Employment Institute, shows how a public-private partnership model can increase the number of apprentices. This usually takes place in enterprises that provide in-house training for employees. Employers operate with a high degree of autonomy but may coordinate with external agencies for specialist content or to broaden the training into core skills. In-house training is financed jointly by the employer and the learner. Typically, the learner accepts reduced wages while training. Fees may have to be paid to external providers for any off-the-job element. The length of training depends on the complexity of the technical skills needed, but it is best for the employer if the trainee became productive as soon as possible. One disadvantage of this type of apprenticeship is the lack of certification. Schazoo Zaka, a family-owned manufacturer of specialty drugs in Pakistan, is an example. The firm has 450 employees, many of whom are women from surrounding villages. In the absence of any formal training, the company makes sure workers are trained off- and on-the-job on the company's premises, using training manuals and other materials developed in-house. Although no formal certification is available for the trainees, they are in high demand among pharmaceutical companies. Leather goods and footwear manufacturers in Bangladesh are among the proponents of this type of apprenticeship. The companies train workers through the Centre of Excellence for Leather Skills, which works with the government to develop and award national certification to graduates. The council employs trainers and assessors certified by the Bangladesh Technical Education Board. The governments of Cambodia, Lao People’s Democratic Republic, Myanmar, Philippines, Thailand, and Viet Nam are working together to raise the quality of in-house training and produce a standard for in-company trainers in Southeast Asia. Curriculum, guidelines, and resource materials for regional master trainers, and a strategic plan for each country to implement the standard will help move company-based work-based learning toward national standards. This is a setup seen throughout Asia and the most common route for school-leavers to enter the labor market. This type of work-based learning is usually unregulated and takes place within micro- and small enterprises. The apprenticeship is financed jointly by the employer and the learner according to the amount of work the apprentice undertakes. Because there is no certification, the apprentice usually finds it difficult to find jobs in the formal sector, or progress into formal, further education. Most likely, after some years of experience, the apprentice will be self-employed. This way, graduate apprentices can use the certification to find jobs in the formal sector, or advance to formal studies. The Association of Construction and Informal Workers in the Philippines, for instance, provides training, assessment, and certification for workers in the informal sector so they can learn new skills while continuing their employment. These workers are in low/underpaid, irregular employment and would be unlikely to have the means or the background to access formal courses. Stung Treng Women's Development Center, one of the largest private employers in Cambodia, recruits artisanal workers to make silk textiles and garments. It employs sericulturists, weavers, sewers, and construction workers and recruits them from its own in-house, on- and off-the-job training programs. The training is structured but not recognized nationally. Open up the various components of the formal training system to private providers and employers. For example, allow workplace trainers to attend government-run, in-service courses for teachers and assessors. Such partnerships can deliver training in priority sectors with little existing training provision, potentially leading to dual certification. Employer associations may help with social marketing, curriculum development, design of training plans, and trainee mentoring and assessment. Develop indigenous workers by making workforce development mandatory in publicly funded projects using structured work-based learning. This addresses the complaints of employers that TVET graduates are not job-ready. Interagency Group on Technical and vocational education and training (IAG-TVET). 2017. Investing in Work-Based Learning. Geneva. OECD. 2014. Skills Beyond School: Synthesis Report. OECD Reviews of Vocational Education and Training. Paris: OECD Publishing. Business Europe. 2016. The Cost-Effectiveness of Apprenticeship Schemes: Making the Business Case for Apprenticeships. European Training Foundation. 2014. Work-based Learning: a Handbook for Policy Makers and Social Partners in ETF Partner Countries. European Commission. 2015. Guidance Framework—Support for Companies, in Particular SMEs Offering Apprenticeships: Seven Guiding Principles. DG Employment, Social Affairs and Inclusion. G20 Task Force on Employment. 2012. Key Elements of Quality Apprenticeships. H. Steedman. 2015. Promoting Safe Work and Quality Apprenticeships in Small and Medium-sized Enterprises: Challenges for Developed and Developing Economies. Geneva: ILO. International Labour Organization. 2011. Upgrading Informal Apprenticeship Systems, Skills for Employment Policy Brief. Geneva. M. Kuczera. 2016. 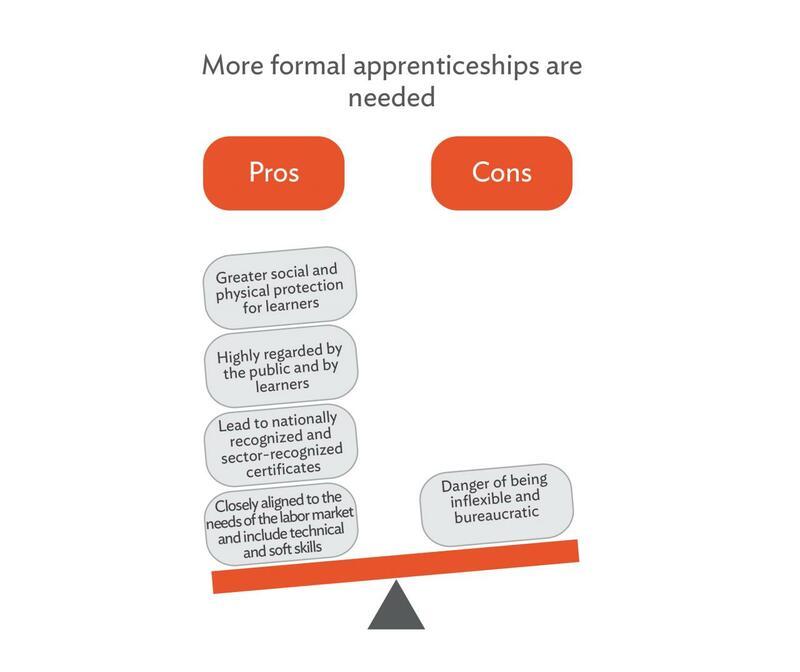 Striking the Right Balance: Costs and Benefits of Apprenticeship. OECD Draft Policy Paper. S. Mühlemann. 2016. The Cost and Benefits of Work-based Learning. OECD Education Working Paper No. 143. Paris: OECD Publishing. V. Kis. 2016. Work, Train, Win: Work-based Learning Design and Management for Productivity Gains. OECD Education Working Papers, No. 135. Paris: OECD Publishing. P. Swaim. 2016. Effective Employer Engagement: Work-Based Learning and More. Slideshow presentation at the 6th International Skills Forum: Innovative Practices in Skills Development at the Asian Development Bank. Manila. Karina Veal served most recently as a senior education specialist for the Asian Development Bank (ADB), where she provided strategic advice and technical expertise to governments across Asia. She also advocated new approaches for ADB's $2.7 billion TVET portfolio. Prior to joining ADB in 2012, she provided consulting services in skills for development, advising UN and bilateral agencies; and held public policy roles in the Australian TVET system. Muriel Dunbar is a specialist in TVET and its links to the labor market. She has undertaken work for a number of donor agencies, including ADB, World Bank, DFID, UNESCO and UNICEF, and completed a five-year term as Director of the European Training Foundation. Her work has included advising donors and beneficiary governments in Asia and Africa on policy development and implementation of TVET reform.